On occasion, a package arrives in the mail from a lubricant manufacturer. Generally, the package contains a lubricant that the company would like for Maximum Velocity to offer on our web site. I then schedule the time to do a preliminary test to see if the lube is worth pursuing. Typically this preliminary test is either a spin test or a slide test (no need for track testing if the lubricant doesn’t perform well). Late in 2008, I received one of these packages, which contained four liquid lubes. Since the season was getting ready to start I didn’t have time to pursue testing then, so I put the lubes on the shelf and scheduled the test for the summer of 2009. Methyl Silicone 5 – 5.0 cSt1 – A colorless, transparent, nontoxic, non volatile liquid used in a variety of applications. Methyl Silicone 20 – 20 cSt – Same as above. XOil – 15.3 cSt – A transparent, colorless mineral oil, It is generally used for lubricating measuring tools and related instruments. To screen these products for possible sale, they would need to be spin tested along with the existing liquid lubes that we offer: Krytox 100 and NyOil II. The equipment used for spin testing was previously described in Volume 8, Issue 6 – “Grooved Axles”. As a refresher, the apparatus consists of a machined steel ring which is sized to fit snugly over a machined BSA wheel. The ring weighs two ounces, which is essentially the load on a rear wheel of a pinewood derby car. In order to avoid lubricant contamination, two wheels were used for each of the five lubes (ten wheels total), and one axle was used for each of the five lubes. The reason for two wheels for each lube was to ensure that the performance of a lube was not exaggerated or degraded due to a “fluke” wheel. The wheels were Ultralight Speed Wheels, which are machined inside and out. To further minimize variance, a single mold number was used for all of the wheels. Each wheel/axle was lubricated in the same manner (lube applied, allowed to flow over the axle, and then blotted off). Then the assembly was placed onto the spin jig. To break-in the lube, five spins were given to each wheel.2 Then five timed spins were performed and recorded. Somewhat to my surprise Methyl Silicon 20 and XOil performed quite well in the spin tests. In fact, they both tested slightly better than NyOil II. So, some track testing was called for. As the Methyl Silicone 20 is rather expensive, further testing was focused on XOil. That testing showed similar results to the spin tests. As a result of this testing, Maximum Velocity is now offering XOil in lieu of NyOil II. 1cSt stands for “centistokes”, the standard for the viscosity of a liquid. As a comparison, Krytox 100 is 4.0 cSt. 2Except for the Methyl Silicone 5 – in this case the fastest spin was the first; each subsequent spin was slower. 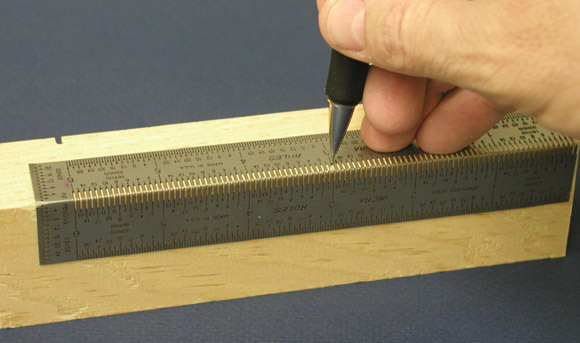 Although you can get away with using a cheap plastic ruler for an occasional pinewood derby car, having a nice, accurate rule (not ruler) is a must for any serious craftsman. But like any tool, there is a large variety of rules available on the market. Today, I want to share with you my favorite rule. In my opinion, this rule is a must have for pinewood derby enthusiasts. The rule I am referring to is the Incra Six Inch Precision Bend Rule. Although this rule wasn’t specifically designed for pinewood derby use, I have to believe that the designer was a pinewood derby parent. The obvious feature of the Incra Bend Rule is the shape. The rule is specifically designed to fit over the edge of a block or board in order to make precise measurement with ease. 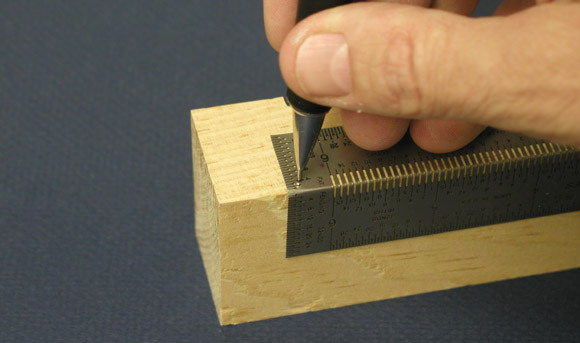 The rule is marked in 1/32 inch increments, and at each increment is a hole and a slot that allows insertion of a 5mm pencil (standard mechanical pencil size). 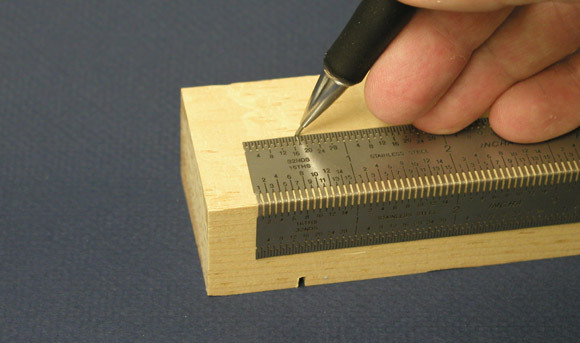 These holes and slots eliminate the inaccuracy that comes with trying to make a pencil mark along the side of a regular ruler. This feature in itself makes this a nice tool, but there’s more. On one end of the Incra Bend Rule you will find measurements that are perpendicular to the rule. These are used to mark offsets from the edge of a block. For pinewood derby cars, the obvious use is marking axle locations, weight hole positions, car thickness, etc. But this offset measurement feature is not just to make a tiny dot, but it can also be used for drawing horizontal lines. 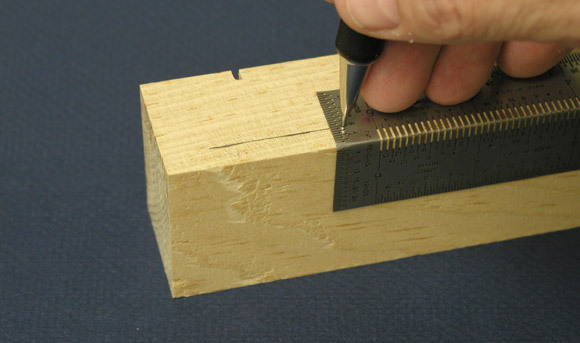 Just insert the pencil at the desired location, and slide the rule along the edge of the block. Sweet! Now the “pièce de résistance”. Do you want to locate the center of your block? One half of the Incra Bend Rule is 3/4 inch wide, while the other is 7/8 inch wide. 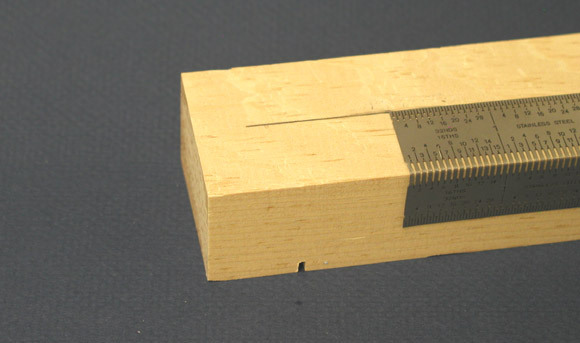 7/8 inch is a familiar number – it is one-half of the width of a standard block. So to find the center of a block, lay the rule with the wide portion on the top or bottom of the block, and strike a line. Since blocks are not consistent, put the rule on the other side, and draw another line. “Voilà!” The center of the block will be between the two lines (or coincident with the two lines if the block is exactly 1-3/4 inches wide). I am confident that you will enjoy this rule as much as I do. This rule is available at some specialty wood stores, but to save you the trouble of tracking one down, Maximum Velocity is now offering the Incra 6 inch Precision Bend Rule. (As an exception, I am dedicating the Car Showcase this week to a car built by Stephen Parks). I was browsing your newsletter archives, and saw the article on the direct drive outlaw car that you built — Volume 8, Issue 3. It was interesting to me because, as an engineering student, I competed in the ASME student design competition, and designed a “string transmission” for a transport device. 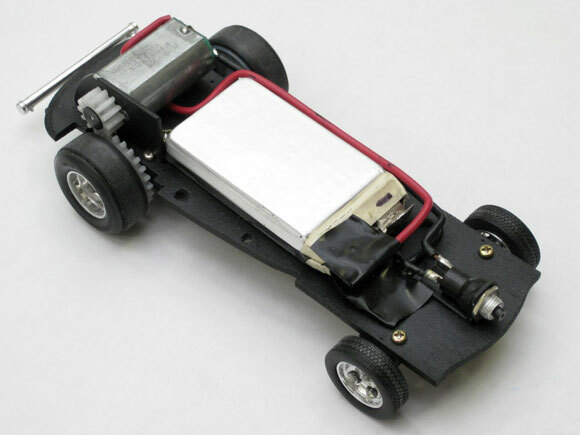 For last year’s pinewood derby event at work, I wanted to make an electric car for the Outlaw class, and initially thought of using the same type of transmission. However, it has some issues. If the wheels spin, then you may not have enough string to power all the way to the end, and if the wheels don’t spin, then you probably should have used more power! Eventually I abandoned the idea of a string transmission, and decided to just use a gear drive. A co-worker races electric RC boats, and sourced a Lithium-Polymer battery. These batteries are expensive, but relatively light, and have almost no internal resistance. I found a few motors that looked to be a reasonable size, then built a dynamometer to test and compare them. This approach wasn’t very consistent, so in the end I simply picked the motor that sounded and felt the strongest. So far, this wasn’t nearly complicated enough for me. I figured that this drag car ought to look like one, so I decided to hide the drive train, switches, etc. 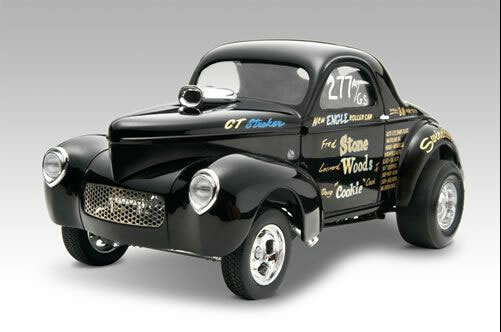 into a drag car model so that it would be a “sleeper”. 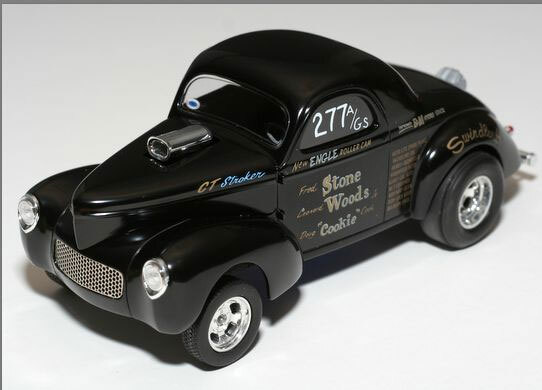 The model I chose was the Stone, Woods, and Cook Willys. The start switch is hidden behind the grille. When it is race time, a pin fits through one of the holes in the grille and into the switch, and rests against the start post on the track. There is an arming switch underneath the car just in front of the rear bumper. There was also a cutoff switch underneath the car, so that when the car falls down onto the stop strip at the end of the track, the power is cut (well, that was the idea). Quite a bit of work was required to transform a model kit that was intended to be stationary into a rolling, self-powered, self-guided vehicle. 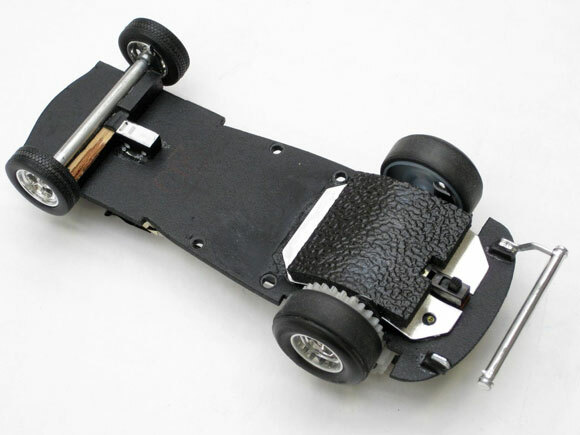 Here are photos of the chassis, showing the motor and gear layout. The silver rectangle is the battery pack. The gears are out of a broken DVD player. I should mention that the track is not set up until the night before the day of the race (after the impound). So, testing is very difficult. But I did get the coordinator to allow a couple of practice runs. On the first run, the tires had too much traction and lifted the front end when they caught on a track joint, resulting in a derail. But that run put enough graphite on the tires to reduce grip enough so that didn’t happen again. The next run was 1.998 seconds, on 49 feet of BestTrack! (WMV format)On race day, the car got a lot of interest for looking good, though some thought that it was “just a plastic model.” No one expected a two second run, and it was easily faster than the other Outlaws, all of which were gravity powered. The run times gradually increased, not because of the battery, but because of graphite buildup on the tires. Going fast was not a problem with this car, but getting it stopped was. I seriously underestimated the speed at the end of the track, and didn’t have a good way to stop the car. At the end of the fourth run, one of the guides that keeps the rubber wheels from contacting the center rail broke, and the car could not stay on the track after that. I took the car out of the race instead of needlessly damaging it further. This year I’ll probably reuse the motor and battery, but forgo the fancy body in favor of a much more robust frame, and I’ll build a stopping device to fit onto the end of the track. I may also switch to front wheel drive to eliminate the possibility of wheelies, and I can then clean the graphite off of the tires after each run to maximize traction and maintain consistent times. Could you give me the order in which to prepare wheels and axles? I have an Advanced Speed Kit, but I’m a bit overwhelmed and don’t know where to start. Polish the wheel surface and inside edge using the Pro-Wheel Mandrel and the fine grit sandpaper (wet the sandpaper). Axle Preparation (assuming raw, out of the box, BSA axles — if they are something else, this would change. Remove the burrs and crimp marks with the mini file (while nail- axle is spinning in a drill). Polish the axles with the axle polishing kit. Mounting – Mount the wheels on the car. 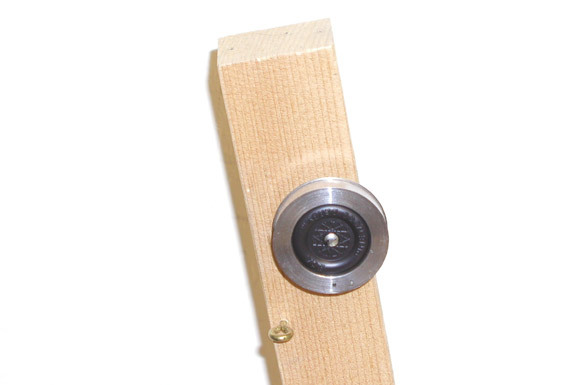 Use the gap gauge to set the gap between the car body and wheel hub. While racing, the two men who were clearly in charge were talking about our cars and showing a disturbed look. I went over to see what the problem was and they told me that the cars only had three wheels touching and that it was a “grey area”. I explained that I was informed that as long as three wheels touched that the cars were in line with official derby rules. My question to you is this, “What is the true stand on the issue of the raised wheel by top officials in the Cub Scouts of America? Unfortunately, “legislating from the bench” is very common in pinewood derby racing. The only “official” rules for pinewood derby racing issued by BSA are the rules in the kit box. Those rules do not prohibit running on three wheels. If a pack is going to use a more comprehensive rule set (which I encourage), then that rule set must be distributed to all participants when the car kit is distributed. Changing rules after kit distribution is a big no-no in my book, as it penalizes those that use their time wisely, instead of waiting until the last minute. I was wondering if I could use rod type axles for a BSA car. If so, do you think they are faster than nail type axles? Generally, in Cub Scout races you must use the nail axles supplied with the kit. But you would need to check your local rules for clarification on this. However, I have found that the nail axles are generally faster than the long rod axles.